Another month, another DLC pack has launched on the XBOX LIVE Marketplace for Forza Motorsport 3 today. 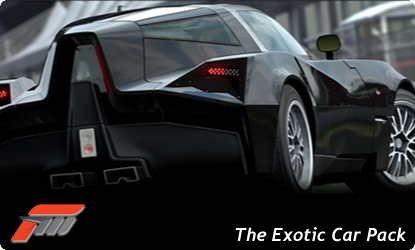 "....The Exotic Car Pack has arrived! Featuring 10 manufacturers that have never been seen in the Forza Motorsport franchise until now, the Exotic Car Pack is a must have for your Forza garage. This month’s pack includes astonishingly fast cars such as the SSC Ultimate Aero, Gumpert Apollo and more. These 10 unique cars are sure to set fast times and even faster heart rates. Be sure to click on the names below to access the vehicle data sheets on each car available in the Exotic Car Pack. Each sheet has in-game photos of the cars and a lot of car specs which should give you a good idea on where you can take these vehicles once you pick up the pack. Available May 11th on the Xbox LIVE Marketplace, priced at 400 MS Points......"
In-game credits are still required to purchase these cars from their respective dealers.